Connectors is a groundbreaking reciprocal reading series which narrows the attainment gap through peer-to-peer learning. Children work in small independent groups, each taking short turns to be the leader as they read a book together and debate issues raised in the text. Clear prompts represented by coloured faces show each child when it is their turn to read and lead, and how to focus the discussion to engage their team members. This exciting approach builds reading and listening skills, promotes successful teamwork and encourages every child to participate. The Sutton Trust ranks peer tutoring as one of the most effective ways to improve achievement, with disadvantaged and low achieving pupils making particular gains. Formal classroom trials of Connectors show children’s reading age leaping forward by an average of 9.1 months in just 12 weeks. Class guided reading time is also increased by up to five times. 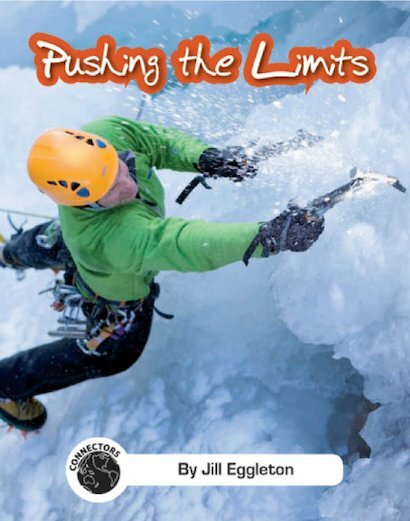 Pushing the Limits explores what drives people to push to the limits of their endurance. Read amazing stories of how far some human beings have gone, using all their skill and courage to reach their goal.